Battle to win back the stolen mixtape from Nebula with Star-Lord’s cool Milano! But watch out for the villain’s armored Necrocraft trying to bash him. Turn Star-Lord’s head to show his masked face, attack with his space blaster and grab that mixtape before Nebula can escape! Price is 30% below the initial Lego retail price, a € 3.00 discount! This comes down to 8.13 cent per brick. 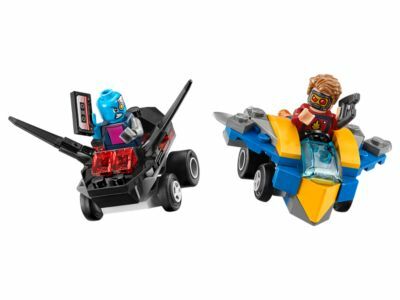 The Mighty Micros: Star-Lord vs. Nebula (76090) Lego set is available from the sites below. However, they do not offer delivery to your selected region. The Mighty Micros: Star-Lord vs. Nebula (76090) Lego set is no longer directly available from the sites below. However, 3rd party partners of these sites might still have the set available. Alternate description Help Star-Lord grab the stolen mixtape from Nebula! This popular superhero toy for kids is suitable for ages 5-12.